Ethiopian visa was issued in 30 minutes! For 1 week before the departure to Africa, I am in Berlin. 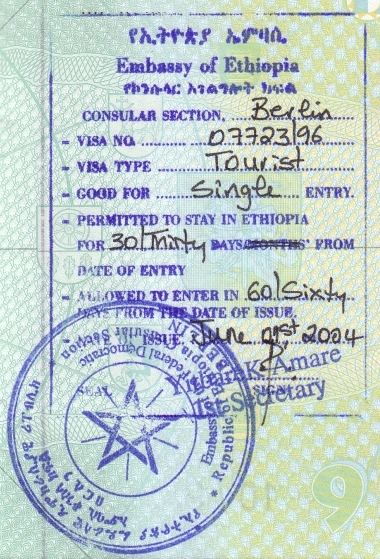 Today I was in Ethiopian embassy and they issued me a tourist visa in 30 minutes. I was charged 58 EUR. I tried to get some discount by showing my "Letter of Recommendation" written by Vilnius Hitch-hiking Club, but the embassy staff did not want to accept it saying that they would consider the letter written by "Foreign Office" (probably meant the embassy of Lithuania or/and Ministry of Foreign Affairs in Lithuania) but not this one.